Our sleek chrome stemware rack, hangs and holds up to 18 wine stems. Save on cabinet spaces, sport your stems. Our sleek chrome stemware rack, hangs and holds up to 18 wine stems. It is designed to fit and hang under cabinets and other shelving systems. Easy to mount, hardware included. Do you I have to use nails to hang it up or there’s an alternative to hang it up ? No nails. Please use screws. It’s more secure. We used wood screws. Works great! Will this fit Riedel Vinum Bordeaux or Zalto Bordeaux glasses? BEST ANSWER: yes! I have large wine glasses that fit perfectly. Martini glasses even can be hung from this rack. Can this be mounted umber a 4in thick glass shelf? BEST ANSWER: This needs to screwed into wood. Maybe. The challenge will be how to attach it to the shelf above. It ordinarily attaches with screws into a wooden shelf above. Can you figure out another way to attach it? Some sort of bracket that would wrap around the shelf edges? Hope this helps. Mine screws into the wood underneath a cabinet. Not sure how you would affix to a glass shelf. If I install 2 of these front to back under a deep shelf will I be able to slide glasses through both racks from front to back? BEST ANSWER: I don't think so, because if you look at the back of the rack, the rack has only one side to slide the glass. You can install them side by side but not one in front of the other. No. As you can see in the picture, the vertical end of each row is the width of the row and the stem would not fit through to slide into the adjoining row of the second rack. Hello my cabinet is 25" wide , is enough to fix it ? BEST ANSWER: I measured the metal and the fine measurement is 25 1/16". The metal will overhang slightly. BEST ANSWER: This glassware rack will accommodate glassware up to 3.5" bases. It will fit glassware that has up to 3-1/2" bases. The large under cabinet mounts with screws(included) You can affix to the ceiling - making sure you properly secure. I have 33" is there another that is wider? BEST ANSWER: The Large Under Cabinet Stemware Rack is 25 1/4 inches wide and is the widest under cabinet rack we carry. Is the stem slot wide enough to accommodate a Glencairn Whisky Glass? BEST ANSWER: No the base of the Glencairn Whiskey Glass is too fat. BEST ANSWER: This should work with the lip. Just set it back so the the glasses can slide in. RMSS commented that: "... it cannot fit large glasses such as for red wines." I have large Bottega del Vino glasses with base diameters of 3.5-inch and 4.0-inch; will they fit? The largest base this rack will accommodate is 3 1/2". I lost the screws that came with my set. What kind and size do I need to get for this? What are the measurements of this wine rack? Looks lovely and was easy to install. We had to use shims though for it to fit properly under standard cabinet. I would give 5 stars if it held more glasses. I replaced my old wood stemware racks because the base of some of my new Ridel wine glasses would not fit in them - they fit quite nicely in this new rack. Since the bottom of my cabinets were recessed, I had to install spacers so that the racks would be in the correct position below the bottom of the cabinets. Can hold up to 18 glasses depending on the size, but small enough to fit under most counters. Money well spent! I had stemware of various sizes filling the top shelf of a kitchen cabinet making it difficult to select an item. I did not want the rack under a cabinet where countertop use would be limited. I fitted the rack to the top surface inside the cabinet using longer screws and plastic spacers. This organized the stemware with negligible loss of storage volume. Doesn't look very elegant, but simple design is effective and stores glasses well. Recommend glasses have a 3" base minimum diameter (all mine do) or I can see how they might slip out. Capacity is probably closer to 12 than to 18 - 3 glasses per track is pushing it, especially if they are larger in size. Tracks are spaced enough so that large glasses can be placed side by side without touching. This is the wine glass rack I've been searching for. It fits our large format glassware. I love this and it works great! I ordered the rack on a Monday evening and received it on Wednesday, which I thought was a prompt delivery. It was packed very well and arrived in excellent condition. This suited our needs perfectly! We transformed an armoir that previously housed a large TV into a liquor cabinet. The rack was installed on the upper surface. It looks great & is very functional! Was delivered in 2 days! I purchased two large wine racks for a new built in cabinet in a dining area...received very fast delivery, packaged well, easy to install right out of the box...great buy! This was perfect for our new wine serving bar. It doesn't take away from the beauty of the glasses. This has been a great rack! We love it. It holds all the wine glasses we got for our wedding, and it clears up so much room in our cabinets. It's great! I use it in my kitchen, to display my lovely wine glasses. It makes for more cupboard space, and is so practical. Great rack. The hardware it comes with is not up to par though ?it simply came with a set of regular screws, no anchors). The screws aren't self drilling, so I couldn't screw them into my cabinet. I had some self-drilling screws so I used those instead. Very good use of space and it looks stylish with all my nice stemware hanging from it. Glad I can finally put them on display rather than hide them in the cupboard! I have this wine rack to my niece for Christmas. She LOVES it! Great gift! Perfect fit for under cabinets. Simple designs holds large stemware. What you see is what you get. Simple metal construction and clean design. It's solid. The big thing for me is this rack fits all my wide bottom Zalto and Riedel stemware. For me, that's the reason to get this. Works great for the Riedel glasses with large bases! We mounted the rack under our kitchen cupboard. It looks great and doesn't take up too much room. I can't believe it was under $20! I love it, it is a perfect size and it was very easy to install. product as advertised, easy assembly,[...]highly recommended. This product is very simple to install under the cabinet. It added a 'delightful look' to my kitchen. Sturdy and elegant; wonderful purchase! Excellent quality. Just look like a professional I saw on other bars. I wish I had more room for another one!! The rack worked great. It replaced one that was not large enough to accept most of the glasses I had. Fits 2 very large wine glasses or 3-4 regular to smaller glasses. I am going to buy another one for a friend! Finally! A stemware rack that fits! I couldn't believe how quickly the package arrived. Stemware Rack - Love It! It uses space efficiently, looks great in my dining room. I would definitely recommend this product. This product is great. It is functional and displays my wine glasses nicely. The best part is the quality of the product for the price. 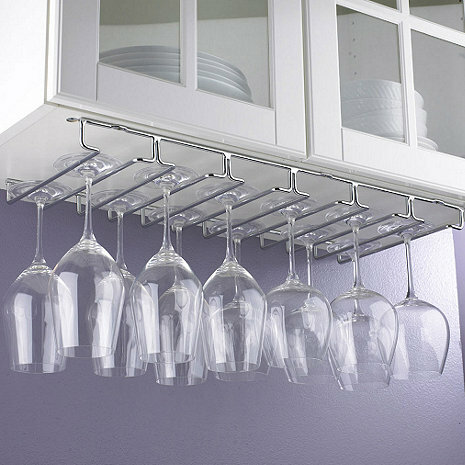 This product was great for holding all our wine glasses and freeing up space! Very useful and keeps the wine glasses safe and secure. This stemware rack was exactly what I was looking for! It's well-made, attractive and very useful! My stemware has 3 1/2" bases so it was difficult to find a rack to accommodate them. This rack works great and was easy to install. [...] As soon as I installed it I liked it so well I immediately ordered another. [...] Product is better than expected. Great Experience. Thanks! I researched this product thoroughly and found that not many people carry it and Wine Enthusiast had the best price. It looks great and was easy to install. Installed cabinets in the dining room. This wine glass rack fits perfectly under the wine cabinet I installed. They are pretty good for my need. They are almost perfect fit on my existing area. The overall quality is O.K. Their price is reasonable. We used this stemware rack underneath a shelf that we built for beer steins. It is in our kitchen. We had too many wine glasses in our cabinets and wanted to show the nice ones along with the steins. It looks great. I used this product to free kitchen cabinet shelf space and to balance a shorter cabinet with the longer kitchen cabinets.